How can one make online payment using ATM debit card? Do you want to pay for your PG form, transcript, conference, products, goods and service online using debit Card but you don’t know how to go about it. Don’t worry; this article will help you on the steps to take. Many online businesses and institutions are now making use of online payment platform to receive payment for their business transactions. There more than twenty online payment gateway platform available in Nigeria today which merchant or webmaster can integrate into their website. 80% of these online payment platform, if not all accept ATM debit card (MasterCard, VISA Card and VERVE Card) as their payment option. However, in most cases little or no guideline are provided by merchants, banks and website owners on how to pay for product or goods online using the ATM debit card. So, today I will throw some light on how to use ATM debit Card for online payment. Before I proceed to show you how to use ATM card for online payment, let us first look at the terms you may encounter when making online payment. A secret code only to be used once and it is generated at the time you initiated an online transaction (esp. via Quickteller) on a local site. CVV Number means Card Verification Value. It is a 3 digit number found at the back of MasterCard, VERVE or VISA credit or debit card. Providing your CVV number to an online merchant proves that you actually have the physical ATM debit card and this helps to keep you safe while reducing fraud. There are three major ATM card companies in Nigeria. They are Interswitch, MasterCard and Visa. Most of the ATM Debit cards issued by Nigerian banks are usually from one of these three companies. The cards include Interswitch Verve, Naira Mastercard and Naira Visa Card. To know which type of card you have, check the front and back of the card to see their logos. Each cards’ serial numbers is on the front of the card. PIN which means personal identification number is provided by your bank when the debt card or credit was first issued to you. PIN numbers allow you to use your credit or debit card at an ATM or when making an in-person purchase with your debit card. CVV numbers are also known as CSC numbers (“Card Security Code”), as well as CVV2 numbers, which are the same as CVV numbers, except that they have been generated by a 2nd generation process that makes them very difficult to “guess”. Online Payment for products and services are usually carried out through a secure online payment platform and just as I have told you, there are more than twenty online payment processor platforms available for Nigerians. To make an online payment on any website, the steps are usually similar irrespective of the online payment gateway being used by the merchant, institution or webmaster. When you click on the Payment button on the merchant’s website, the payment gateway on webmaster’s website connects you via a secure tunnel to your ATM Card company which then connects to your bank to process the transaction and deduct the amount from the money in your bank account. Here is simple step on How to make a online Payment using debit card. On the payment page for the product or services that you are buying or paying for, you will find a payment button. To begin the online payment process, click on the payment button. Select the payment option, to pay with ATM debt card. To pay using a different option, select the appropriate option. Click on Proceed. Click on the drop down box or if shown, select your card type. For local online payment, most sites accept Interswitch Verve cards, Naira Mastercard or Visa card. For payment of products and services online on a foreign website, MasterCard and VISA card are usually accepted. After selecting your type of card, the actual payment console appears below. In it you will be expected to fill in your ATM card details. If you are using a Visa card, you need to first accept the Visa terms and conditions before proceed. • Card serial Number: type in your card serial number. 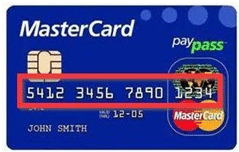 It can be found on the front of your ATM card as shown in the following picture (red box). 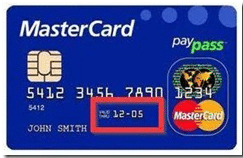 • Expiry Date: The expiry date for your card can usually also be found on the front of the card. If it is not on the front of your card, check the back. • Entering your PIN: Your PIN is the same as the ATM PIN which you use when you withdraw from an ATM machine. For security, entering the PIN cannot be done by typing but by clicking on the numbers in the numeric keypad (or PIN pad) as shown below. • Enter your Card Verification Value (CVV2): The CVV2 (or CVV) is a set of 3-digit number found at the back of your card. The CVV2 is another security measure meant to protect the card from unauthorized use. To get your CVV2 code, turn to the back of your card and you will see the numbers. If there are more than three numbers then the CVV code is the last three numbers in the set. When you click on the make Payment button; if you are making payment on a local site, an SMS message containing one-time-password (OTP) will be sent to the phone number that is link to your account. Check your phone and enter password on security box that will be displayed. If you are making payment on a foreign website, you will need a secure code. You can generate a secure using a Token issued by your bank. Input the secure code. Tip: Do not refresh the page or use the back button while processing a payment. If you make an error or there is a network failure, instead of refreshing the page, close it, open a new window or tab, go to the initial page having the payment button and start from Step 1 again. If the transaction is successful, you will get a message that says Transaction Successful. This means that your ATM was successfully billed and your payment successful. Warning: any online payment platform that does not request OTP/secure code is not fully secure. Please, don’t make any payment on such website. For questions or comments, you can use the comment box below this article. If you have enter problem while making any online payment, don’t hesitate to drop your challenge on the comment box below.